Outing is always refreshing for me; so whenever possible I used to go for it. For doing so, my supporting friends were always there for me. 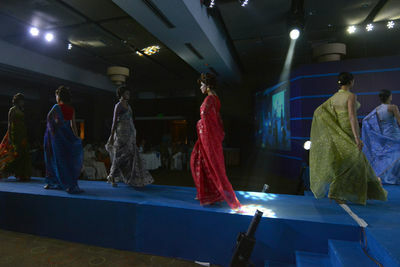 Most of them were photo freak and the photos they took were really vivid and lively. Cherishing memories by looking at those pictures was always inspirational for me. So I also decided to do the same with my camera. By that time I got a bunch of friends who are photographers and those new friends give a new dimension to my love for the photos. From them I got to know that clicking pictures and a good piece of photography is not the same thing. Snapshots that they took never failed to thrill me. 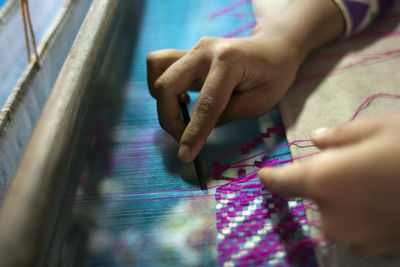 In fact those charming photos touched my soul, so I decided to be a photographer like them. 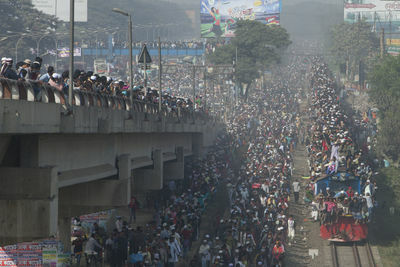 Bishwa Ijtema (pronounced biz-wah ist-emah), meaning “global congregation,” is an annual spiritual gathering held near the river Turag in Tongi, Bangladesh, a suburb of the capital city of Dhaka. The event focuses on prayers and meditation, and the organisers from the Tablighi Jamaat Islamic Movement forbid political discussions. The congregation is officially open to people from all faiths, though it is attended predominantly by Muslims from all over South Asia. It is one of the world’s largest annual congregations of Muslims after the Arbaeen gathering in Karbala in Iraq and the Hajj to Mecca that constitutes one of the five pillars of Islam. 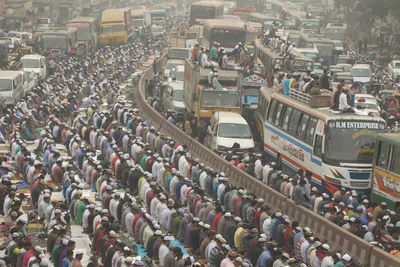 More than five million Muslims, many from other countries, gather for the Bishwa Ijtema. Despite the large number of devotees living within a confined space, generally there are very few problems of sanitation, cooking, and internal movement. 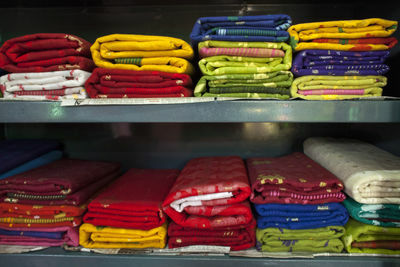 It is believed to be possible because of the minimalist approach adopted by the devotees. Mohammad Mojammel Hoque, a seventy-year-old farmer from from the Vola district of Bangladesh comes every year to what now amounts to a pilgrimage. One of the congregation’s foundational traditions, mass dowry-free wedding ceremonies are held on the second day of Ijtema. 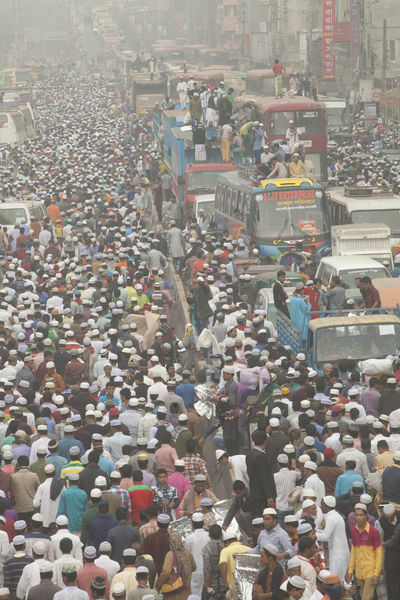 Bishwa Ijtema began very humbly in 1946, when an Indian scholar met with a few people at a local mosque . 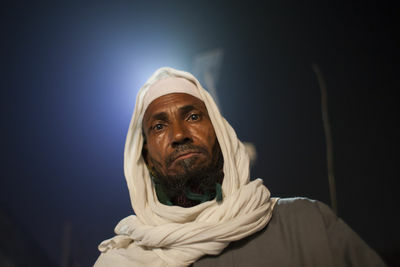 Muslim followers come to the gathering, located on the Turag River near Dakar, to receive blessings and interact with the throng of followers that descend on the Ijtema grounds. It provides many with the opportunity to study the Qur’an and listen to various sermons. Attendees use the three days of the Bishwa Ijtema to concentrate on their religion and explore aspects of it that they are not familiar with. It is a mix of religious education, spiritual adulation, meditation, blessings and exaltation. Although political views, beliefs and negotiations are not permitted to be discussed or explored, many have questioned the attendance of high ranking officials and delegates to the gathering, who are known to be inactive in their religion and whose political decisions and way of rule does not always agree with Islamic teaching. 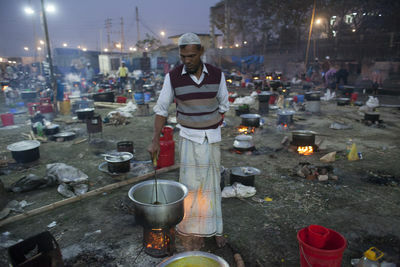 However, their presence does not concern devotees, who attend Bishwa Ijtema for their own personal enrichment. They hardly notice the difference between those who are there to worship and those who are there with ulterior motives. 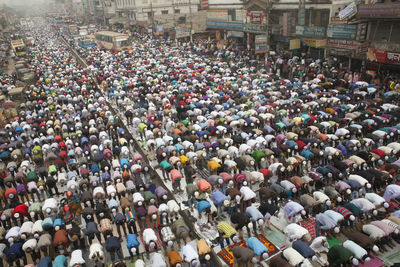 Bishwa Ijtema ends with Akheri Munajat (final prayer) seeking spiritual well-being and welfare of the Muslim Ummah. 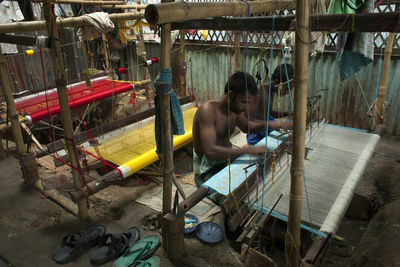 Shipyard workers near the Buriganga River in Dhaka face difficult work conditions. According to witnesses, many workers died in accidents related to explosions. 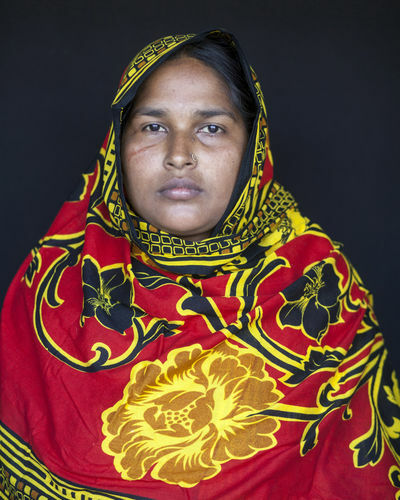 The death toll from 2012 to 2014 at ship recycling yards stands at 44, leaving dozens of ship-breaking workers wounded. Workers break down the rusty, old supertankers, cargo ships and cruisers that are no longer in use to reuse their steel and parts in new ships. 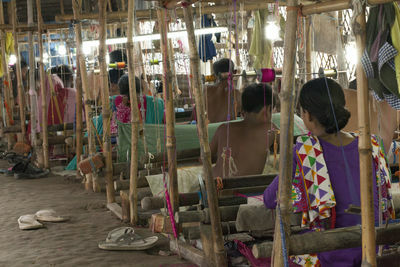 There are more than 35 shipyards in Old Dhakas Keraniganj area in the bank of the river Burigonga, where small ships, launches and steamers are built and repaired around the clock. 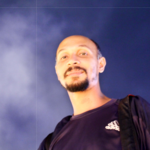 Jamal Uddin, 32, has worked in the shipyard since 2012. 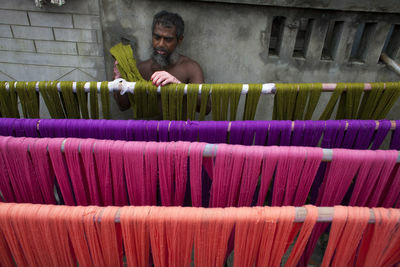 He is a father of two and lives in his home-district Ranngpur. "I work in this place on a daily basis. There are no days off or holidays, so I can't go visit my family regularly. If I want, I can visit my house once a year for one week but without payment." Most of the private shipyards use plate-steel, engines, components and machinery from old merchant ships, collected from many ship recycling industries located in Bangladesh. However, frequent accidents and heavy human causalities on inland vessels often raise questions about the quality of ships produced in local shipyards. A primary school is situated near this yard, and children make their way to their classes using a dangerous path inside the shipyard, some of them using it as a playground, though a dangerous one. 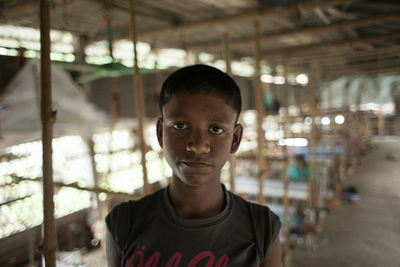 Other children, mostly climate refugees from flooded areas of the country, work there collecting scrap metal and used oil to sell in local markets. Bangladesh is now exporting small and medium-sized ships for the highly competitive European market, building vessels for countries including Denmark, Germany and Finland. 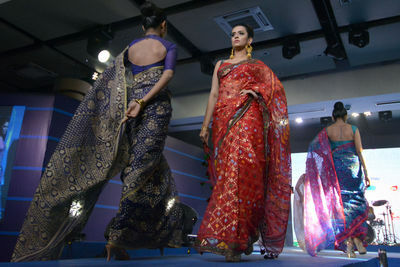 Bengali shipbuilding is being compared with giants such as China, Japan and South Korea. 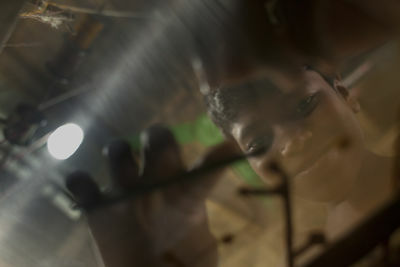 Child worker in Rice processing factory worked that help their mother as an helping hand.By working from 8 a.m. 6 p.m. on a daily basis for child worker earned 50 taka ($0.65 USD) per day and they contribute them to their family.Most of them age are 8 to 11.Full-time work frequently prevents children from attending school. 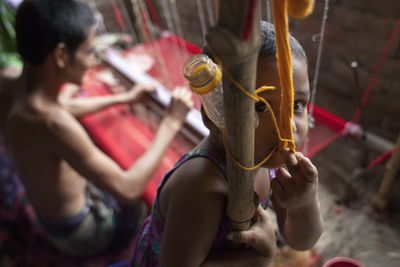 According to the Labour Laws of Bangladesh, the minimum legal age for employment is 14.UNICEF estimates that around 150 million children aged 5-14 in developing countries are involved in child labour. They never knew the darkness of a grisly night could be a portent of another dark episode of their lives waiting ahead. 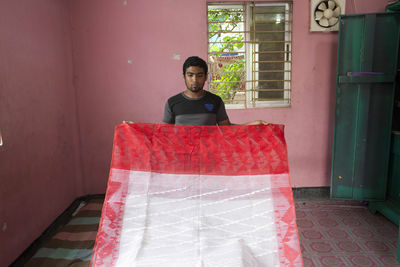 The heavy air filled with smoke and heat, and the loud, terrified screams of the many people trapped inside the blazing Tazreen Fashion building were just the beginning of a drawn-out struggle survivors of the fire would still endure two years after the tragedy. 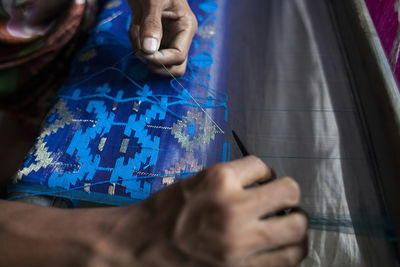 On 24 November 2012, at least 117 people burnt to death after becoming trapped behind locked exits at the Tazreen Fashion factory, which supplied clothes to global brands. Two-hundred more people were severely injured in the fire. Those who were lucky to survive do not feel like that anymore, as they suffered serious injuries, received no compensation, and are now left without a source of income. 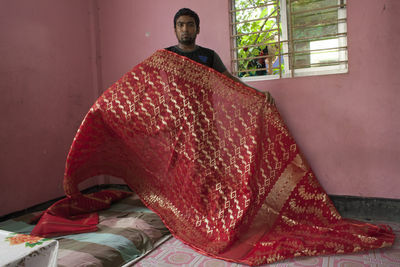 More than one-hundred of the injured Tazreen workers face extreme hardship and struggle to bear the costs of their treatment. Anju Ara is one of them. "Sometimes the intensity of the pain drives me mad," she said. "I break things in desperation. I wake up screaming 'fire! fire!' at night. I can't sleep." 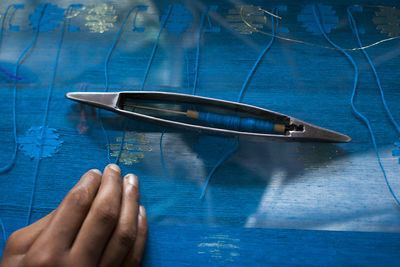 A good number of survivors are yet to recover from the trauma of the terrible incident, having lost their mental strength permanently, not able to work in the garment sector or in any other industry. Many others could not afford proper treatment afterwards and have developed fatal health complications over the last 24 months. The fire started on the ground floor of the nine-story factory – and while the fire was consuming the lower floor, many desperate workers were stuck on the second, third and fourth floors of the building. Finding no way out, they broke windows on the eastern side, and jumped out. Some survivors say their new lease on life has become a curse amid the practicalities of poverty. The list of health problems among them is long. Kidney disease, backbone problems, and chest pains prevail, and many also suffer from severe post-traumatic stress and crippling fear whenever they try to sleep. Shahnaz Begum, 36, jumped from 3rd floor of the building. “I lost an eye and I’m having backbone problems,” she said. She now has to struggle to make a living and survive two years on. Both Hasan Mia, 30, and Mahfuza Akter, 20, jumped from the second floor and survived the deathly fire that killed their friends and co-workers. “I now suffer from psychological and mental illness. It’s hard to think of that day,” says Mia. Like her colleague, Mahfuza suffers from the same illness. 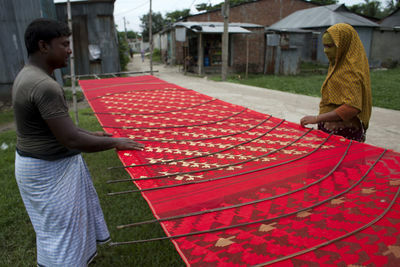 The 2012 Dhaka fire was the deadliest factory fire in Bangladesh's history. The cause was initially blamed on a short circuit, however the government later declared that it could had been an “arson attack or sabotage" due to the occurrence of previous similar events. 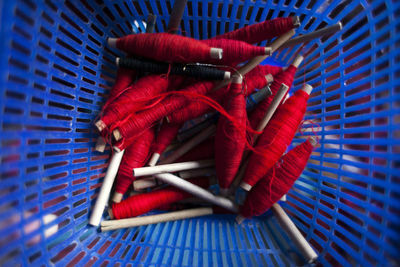 Because of the large amount of fabric and yarn in the factory, the fire spread quickly to other floors, burning the building for over 17 hours before the firefighters were able to extinguishing it. 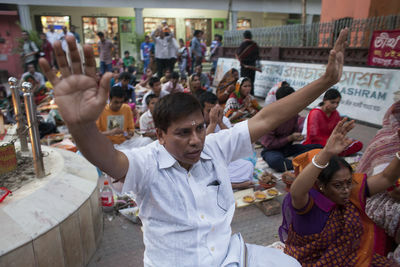 Every year, in the month of Kartik on the Bengali calendar (late October through early November of the Gregorian calendar), members of Bangladesh’s Hindu community come together to celebrate the “Rakher Upobas” prayer to the god Lokenath Brahmachari, who is said to embody love in the Hindu tradition. 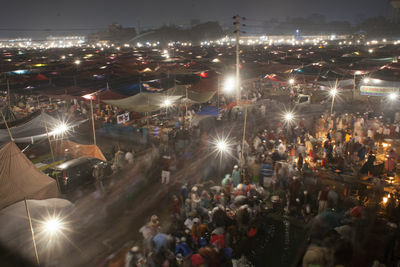 At the Shri Shri Lokenath Brahmachari Ashram near Dhaka, men and women light lamps and candles and bring offerings of fruit, sweets, nuts and cow’s milk. Devotees pray to Baba Lokenath to save their family and dear ones from curses and diseases like cholera and pox; they observe a strict fast and remain sitting absorbed in prayer until the flames burn-out. Members of other faiths are welcome and often present at the prayers, though for more cultural than spiritual reasons. Lokenath Brahmachari was born to a Brahman (an elite caste reserved for spiritual service in the caste system) family on the birthdate of the Hindu Lord Krishna in 1730. At eleven, he ventured off to the woods with his guru to practice Ashtanga and Hatha Yoga. When he left, he is said to have lived a life of complete asceticism until reaching enlightenment at the age of 90, after which he traveled extensively through Afghanistan, Persia and Arabia, including making three pilgrimages to Mecca. At the age of 136 he is said to have settled in a small town near Dhaka to tend to people who came seeking his teachings and blessings. Rising global temperatures have been accompanied by changes in weather and climate, and many places have seen changes in rainfall, resulting in more floods, droughts, or intense rain, as well as more frequent and severe heat waves. Climate change is now one of the greatest threats facing the planet. 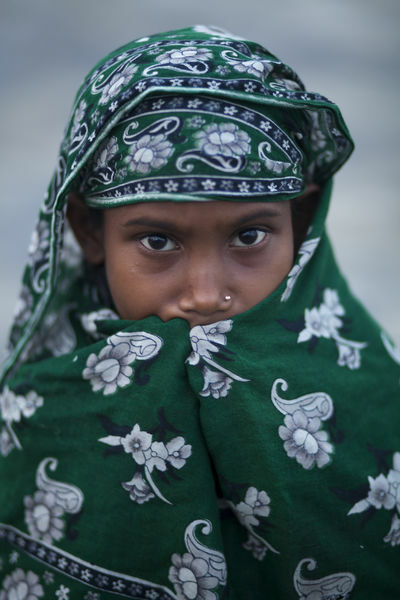 Bangladesh is one of the most vulnerable countries, as the lives and livelihoods of millions of Bangladeshis are challenged due to climate change. A study by UK researcher Maplecroft cites Bangladesh at the top of a list of 32 nations at risk due to the alarming effects of climate change. Low lying coastal areas are speculated to be submerged as the sea level rises, and as world temperature continues to go up. Two recent cyclones, Sidr (2007) and Aila (2009) totally devastated the coastal territories of Satkhira and Barguna along with many others in Bangladesh. 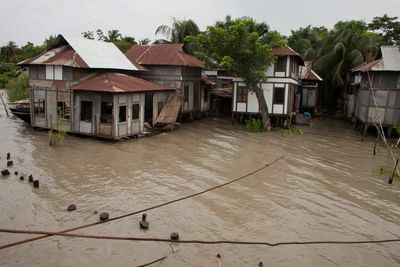 Hundreds if not thousands of people have lost their land and their homes to erosion along riverbanks and coastal areas. 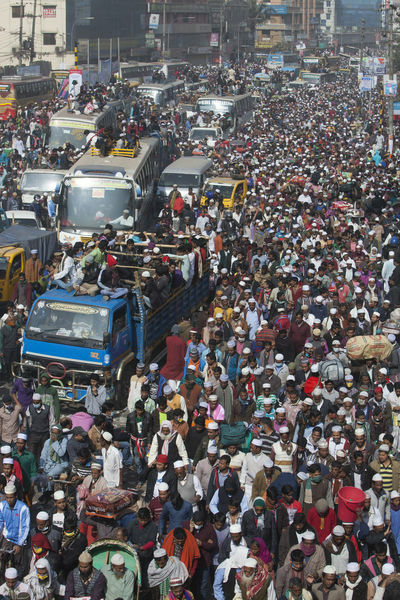 Bangladesh is one of the countries in the world with the highest proportion of the population living in coastal areas. Some 32% of the habitable land lies in coastal areas, equivalent to 47,211 square kilometers. According to the population census in 2001, about 35 million people, or 28% of the total population, live in these low-lying coastal areas. 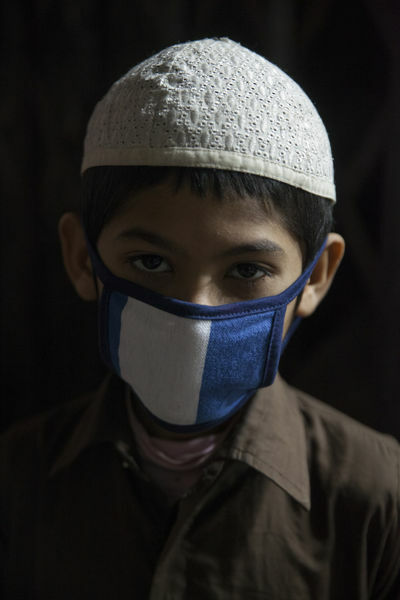 Another cause for alarm that exacerbates the effects of climate change on the population in Bangladesh is pollution. By throwing waste chemicals and oil from factories into canals and rivers, soil and groundwater become polluted. Industrial processes are not only a factor in climate change, but also produce toxic waste that threatens Dhaka's natural resources. 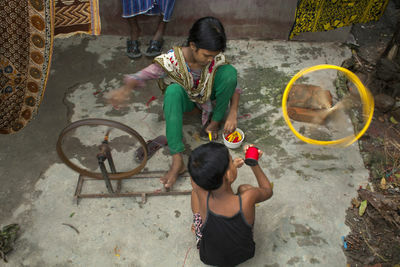 Manual laborers in Bangladesh face harsh conditions, working 11 hours days, often for under $2 an hour. 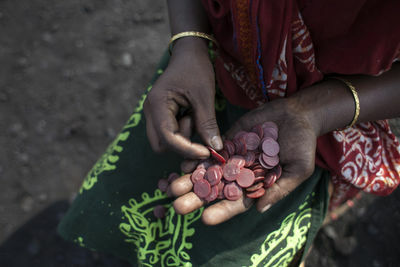 According to ILO (International Labor Organization), the harsh reality is that some 375 million working women and men are not able to earn enough to keep themselves and their families above the $1.25 a day extreme poverty line. 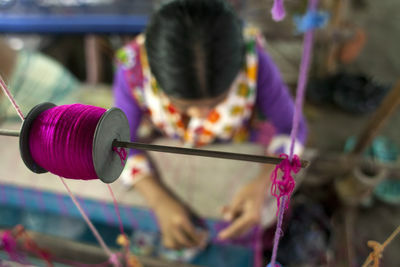 That is around one in eight of the employed population of the developing world where more than a quarter of working women and men live with their families on $2 a day or less. 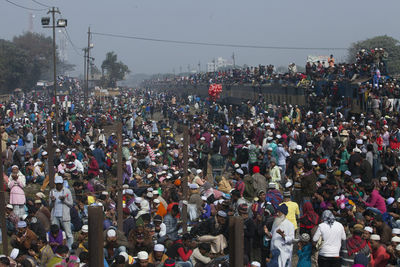 After Akheri Munajat, the final prayer of Bishwa Ijtema, people return home by train, bus and on foot. 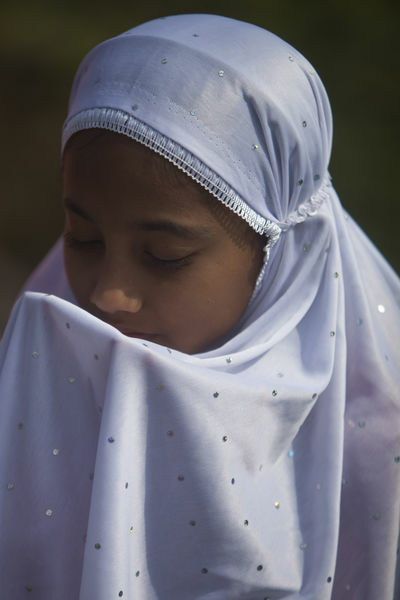 A young girl prays the Akheri Munajat, the final prayer)of Bishwa Ijtema, at Tongi rail station. 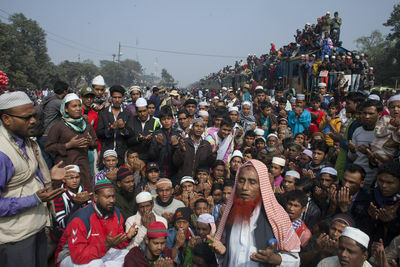 Pilgrims take part in the Akheri Munajat, the final prayer of Bishwa Ijtema, at the Tongi rail station. 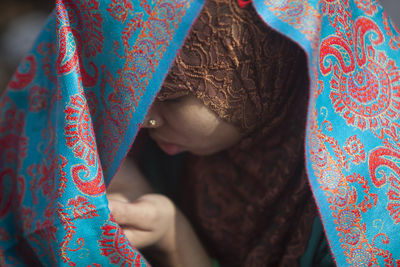 A young woman prays the Akheri Munajat, the final prayer of Bishwa Ijtema, at Tongi rail station. A young woman prays the Akheri Munajat (final prayer) of Bishwa Ijtema at Tongi rail station. 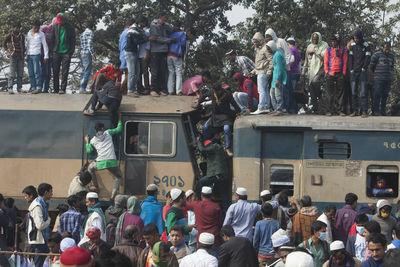 A train overflowing with pilgrims arrives in Tongi rail station, near where the Ijtema is held. Many have travelled from all over the region to participate in the three-day religious congress. A child named Mohammad Hasan attends Friday prayers alongside the male members of his family. 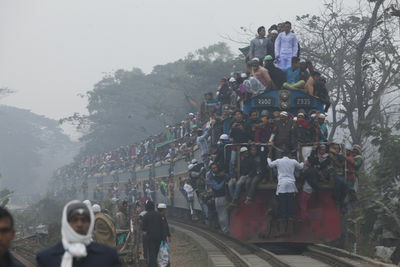 A train overflowing with pilgrims arrives to the neighborhood in Tongi where Bishwa Ijtema is held. Many have travelled from all over the region to participate in the three-day religious congress.